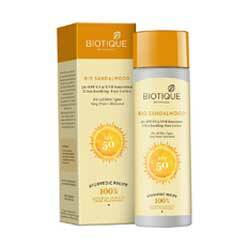 Biotique Sun Protection - Worldwide Shipping. Protects skin with SPF 40 UVA/UVB sunscreen. Keep skin soft, fair and moisturized in the Sun. This nutrient-rich Lotion is blended with pure sandalwood, saffron, wheat germ, honey and bark of the arjun tree to keep skin soft, fair and moisturized. Protects skin with broad spectrum SPF 50 UVA/UVB sunscreen. Very water resistant, retains SPF after 80 minutes in the water.